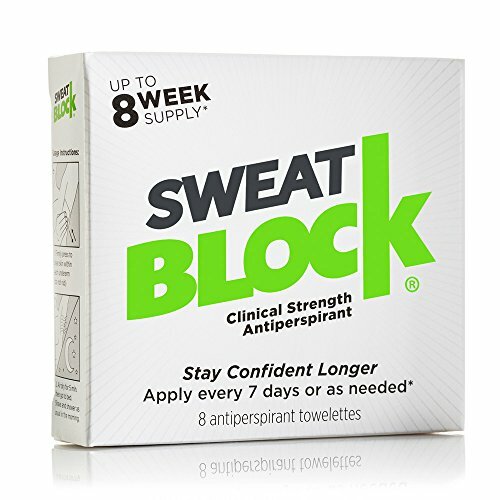 Dab on a SweatBlock antiperspirant wipe and control excessive sweating for up to 7 days* per use... So you can confidently raise your arms. Like a crack in a mirror, pit sweat is impossible to ignore. You ve tried clinical strength deodorant solutions -- only to be let down. And layering in dark/baggy clothing to hide armpit sweat only makes it worse. With SweatBlock you can wear any color, any fabric, in any season or situation w/o people seeing you sweat. Thousands of people have changed their lives with SweatBlock. You ve got nothing to lose. It ll be the best antiperspirant you ve ever tried or your money back. 2. SweatBlock is a strong anti-perspirant. For some, irritation can occur. To reduce the chances of irritation, don t apply immediately after shaving or to a wet/ sweaty underarm. See instructions for more details. Stop use if irritation persists. 3. 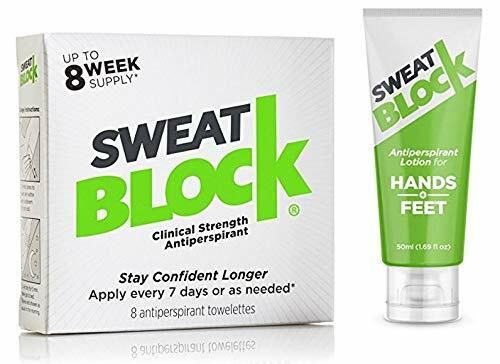 SweatBlock is a strong antiperspirant for underarm sweat, but many customers successfully reduce sweat on body sweat areas like hands, feet, face, back, neck, etc. The SweatBlock guarantee applies only to underarm usage. 4. 1st timers should apply nightly (2-4 nights) until dry armpits are achieved, then apply once-a-week or as needed. LOVE IT, OR IT'S FREE - 30-day money back manufacturer guarantee! 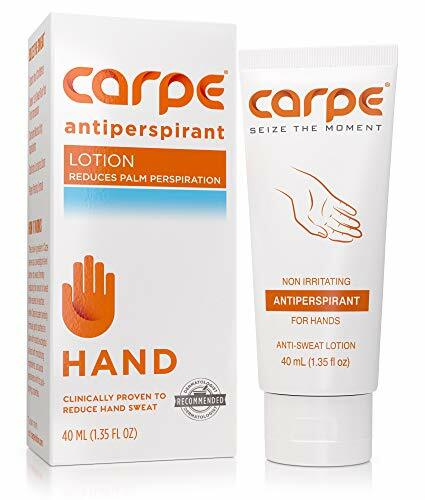 Carpe Antiperspirant Lotion is dermatologist recommended, over-the-counter daily formula for sweaty hands. Carpe's unique clinically proven anti-sweat antiperspirant and deodorant formula with 15% aluminum sesquichlorohydrate was designed to work quickly to reduce sweat, without causing irritation or leaving residue. For treating excessive sweat and hyperhidrosis resulting in sweaty palms. Carpe is extra-effective, clinical strength, non-irritating, quick-drying, paraben free, cruelty free, safe for sensitive skin, and not tested on animals. Made in the USA. EXTRA-EFFECTIVE: The #1 dermatologist-recommended treatment for sweaty hands. Our clinically proven antiperspirant hand lotion was specifically designed to stop sweaty, clammy hands and palmar hyperhidrosis, or excessive hand sweat. Achieve zero sweat, restore confidence, and enjoy life with dry hands! EASY TO USE: With a pea sized amount of Carpe Antiperspirant Lotion you can instantly reduce sweat without side effects. Apply daily for best results and say goodbye to your sweaty, clammy hands without having to suffer from the side effects associated with prescription solutions, such as drysol, iontophoresis, or botox injections. SMOOTH: A 100% smooth, non-greasy, and non-irritating clinical strength antiperspirant lotion that includes natural eucalyptus oil and moisturizing ingredients that gently sooth the skin while avoiding greasiness with its quick-drying properties. AWARD WINNING FORMULA: As seen on Good Morning America, Carpe's patent-pending, FDA-compliant formula has been independently tested and proven to be the leading over-the-counter sweat treatment. 100% Money Back Guarantee: Carpe was formulated to restore confidence and deliver a peace of mind, so sweaty hands are the last thing that you need to think about. Carpe has changed the lives of thousands and thousands of people, but if you aren't one of them, no worries - we will give you your money back, no questions asked! Control Sweat, Eliminate Embarrassment, Raise your arms in Confidence with Safe, Effective ZeroSweat Antiperspirant Why you'll love ZeroSweat: **No mess application **No more sweat marks or pit stains **Wear any color or style of clothing with confidence **No more embarrassment **Up to 7 days protection **Safe and effective **Money-back guarantee! 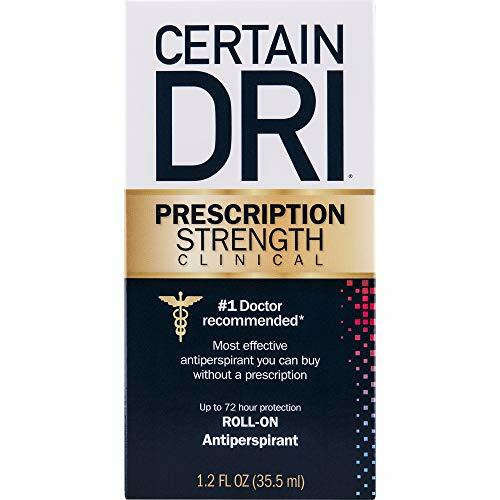 If you've tried everything on the shelf, even "clinical strength" antiperspirants, or are worried about the risks or surgery or injections, or have just given up hope, we have your solution! Our customers report life-changing results. We're so confidant this will work we offer a 100% money back guarantee. CAUTION: Do not use immediately after shaving or showering; or if skin is broken or irritated. Skin area must be completely dry prior to application. Discontinue use if rash develops and immediately wash affected area. Keep away from eyes. Keep out of reach of children. Do not use if you are allergic to aluminum. 1. Apply Sparingly. ZeroSweat should be applied sparingly only a few strokes under each arm. 2. ZeroSweat can cause irritation for new users. It is powerful and active pores are sensitive. If you experience irritation immediately wash ZeroSweat off and wait several days before trying again. 3. For minor irritations try applying a little Vaseline or regular deodorant after it dries to sooth the area. It s that moment you realize an important hand shake is inevitable or you have to remove your shoes in public. WIll I gross them out with my sweaty hands? Will they see or smell my sweaty feet? We know what it s like to not hold hands because of sweaty palms. We ve seen those looks people give after a sweaty hand shake. We know the shame that comes when foot odor fills the room. People shouldn t judge you because your hands sweat or feet stink... but do they? With SweatBlock Antiperspirant Lotion for Hands and Feet you can look forward to holding hands or kicking-off those shoes without worry. SweatBlock is an anti sweat hand lotion for hyperhidrosis hands and sweaty palms. For stopping hand sweat, start by using SweatBlock nightly for 2-4 weeks before bedtime (results can be immediate and effectiveness increases over time). Once effective, apply at night as needed. Also, apply 15 minutes before meetings, dates, workouts, etc. SweatBlock is great for stopping foot sweat and taming smelly feet caused by bacteria. For stopping foot sweat & reducing odor, start by using SweatBlock nightly for 2-4 weeks before bedtime and (results can be immediate and effectiveness increases over time). Once effective, apply at night as needed. Make sure feet are clean and dry before use. 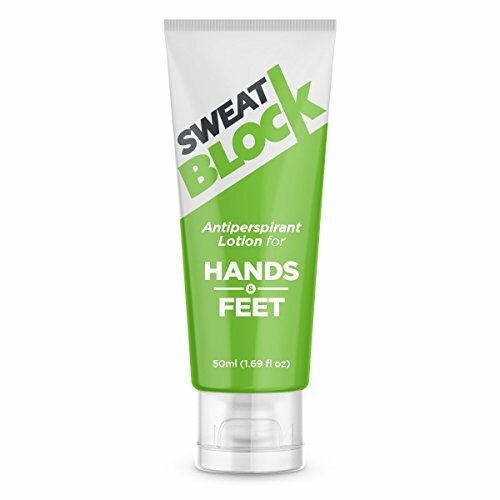 SweatBlock Antiperspirant for Hands and Feet is backed by a 30-day manufacturer money-back guarantee. Imagine how good it would feel to stop sweating hands and sweaty, stinky feet. With SweatBlock, it s possible. You ve got nothing to lose (all the risk in ours). Thousands of people have changed their lives with SweatBlock. We dare you to give it a try. Comes in sealed tube in an unsealed zip bag. NO SWEAT CONFIDENCE: Proven formula to reduce palmar & plantar hyperhidrosis & excessive sweating. Our goal is for you to have confidence in your biggest moments. LOVE IT, OR IT'S FREE: Don't sweat it, just contact us! 30-day money back Sweat Block guarantee. Function Absorbing underarm perspiration.Keeping your underarms clean and dry all day long. garment. Men & Women Simply the best! Suitable for most skin types,hypoallergenic.Gender neutral design, non-scented materials provide an answer for both. Comfortable & Convenient Super soft,ultrathin.Light weight and portable, nearly invisible.Disposable, no washing necessary.Perfect for outdoor and travel. Premium Quality With a mix of the highest quality microfiber fabrics,our sweat pads are efficient,breathable,extremely absorbent and sticky,but without residues. 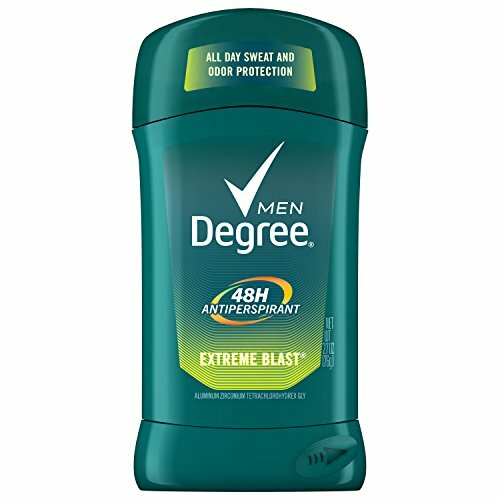 Degree Men Extreme Blast helps keep you fresh and dry, no matter what. A men s antiperspirant that offers 48 hour Original Protection with a scent that combines energizing fresh mint with notes of apple and melon. Whether you re having a long day in the office, playing sport outdoors or working out in the gym you can be confident you ll be protected from sweat and body odor. 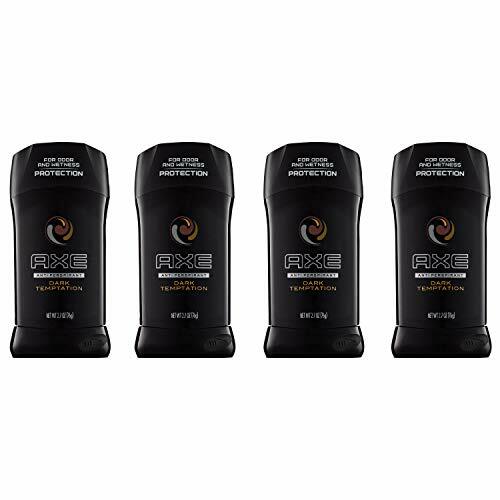 Designed by experts to be activated by your body heat, Degree Extreme Blast is a men s antiperspirant deodorant stick that works as hard as you do, keeping you dry when you need it most. As well as being highly effective, Degree Extreme Blast has a smooth, mint scent that will keep you fresh all day. Keep comfortable and confident thanks to Degree Extreme Blast s long-lasting formula that is tough on sweat, but not on skin. It comes in an easy-to-use applicator stick - you simply turn the dial to raise the stick, apply a thin layer to your underarms and you re ready for anything. Stay dry, cool and confident thanks to Degree Men Extreme Blast. A men s antiperspirant stick that offers 48 hour Original Protection with a scent that combines energizing fresh mint with notes of apple and melon. Body heat activated Degree Men Extreme Blast gives you long-lasting protection when you need it the most. Degree. It won t let you down. 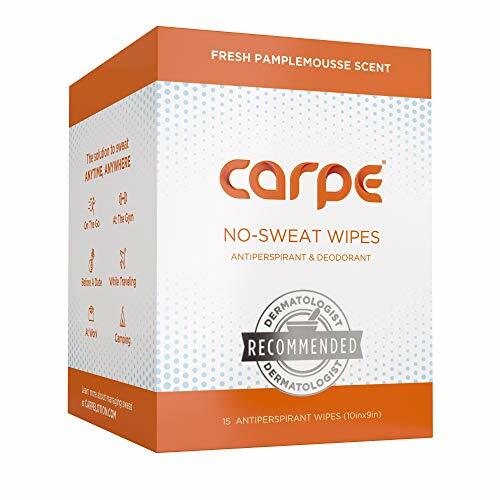 Carpe Antiperspirant Body Wipes - Dermatologist recommended, non-irritating, residue-free and sweat blocking, Great for hyperhidrosis - 15 individually wrapped wipes. A convenient, on-the-go wipe that helps keep you feeling fresh, clean, and dry wherever, whenever. Perfect size wipe allows you to apply underarms and all over body for an ultimate shield of sweat protection. Individually packaged and inconspicuously fits in your pocket to use when your day needs a confidence boost. No residue formula protects your dark shirts from streaks and stains. A light, clean, fresh scent invigorates the senses with top notes of Natural Lemon, Fresh Natural Grapefruit, Natural Mandarin, Summer Orange, Pamplemousse, and Bergamot. Once the invigorating citrus top notes dissipate, a complex combination of Pineapple, Fresh Melon, Apple, Lily, Jasmine, and a refreshing Marine Accord and Musk leave behind an captivating scent that assures you're always smelling fresh and clean. EXTRA-EFFECTIVE: The dermatologist-recommended clinical strength solution for excessive sweating. Zero in on excess sweat, restore confidence, and enjoy life with dry and fresh body! EASY TO APPLY BODY WIPES FOR MEN OR WOMEN. Extra large 10.5x9 wipe covers as much as you need. Can be used on dry, damp, or wet skin. Goes on clear. No residue, keeps shirts clean. ON THE GO USE - Use at the gym, as shower wipes, before a date, while traveling, at work, while camping, or anytime you can't shower. Use on hands, feet, underarm and body. Folded single-use packets fit discreetly in shirt pockets. FRESH SCENT - Light, clean and non-greasy formula that smells like natural citrus and sage. Includes sage leaf extract, a natural antiperspirant and antihidrotic to bolster the clinical strength antiperspirant aluminum cholorohydrate. 100% MONEY BACK GUARANTEE: Carpe Antiperspirants are formulated to restore confidence and deliver a peace of mind. Carpe has changed the lives of thousands and thousands of people, but if you aren't one of them, no worries - we will give you your money back, no questions asked! Degree Women Dry Protection Antiperspirant Deodorant Shower Clean 2.6 oz is an invisible solid antiperspirant deodorant stick that provides 24 hour trusted protection against both sweat and body odor. With Degree Women, stay fresh and dry, no matter what. 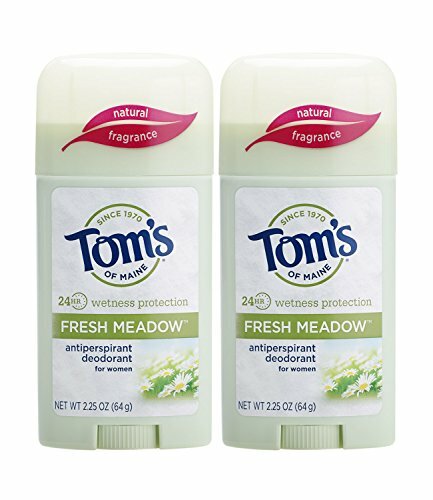 This Degree Women antiperspirant deodorant contains Degree's original body responsive formula, which was designed by experts to provide 24 hour protection against sweat and body odor. It's tough on sweat, but not on skin. This deodorant is perfect for every-day use. Whether you're in the office, playing sport outdoors or working out in the gym, you can be confident that you'll be protected from sweat and body odor with Degree Women. So choose the fragrance that fits you best, and keep moving with confidence that you'll stay fresh thanks to Degree Women deodorant as you perform at your best. It comes in an easy to use applicator stick. You simply turn the dial on the bottom to raise the stick, apply a thin layer to your underarms, and you're ready to go! Stay dry, cool and confident with Degree Women. Try pairing this deodorant stick with a Degree Women Antiperspirant Dry Spray! Trust Degree Deodorant for Women to give you long lasting protection with fresh fragrance for when you need it the most. Degree. It won't let you down. An invigorating, clean, floral scent of rose and jasmine, blended with delicate fruit. 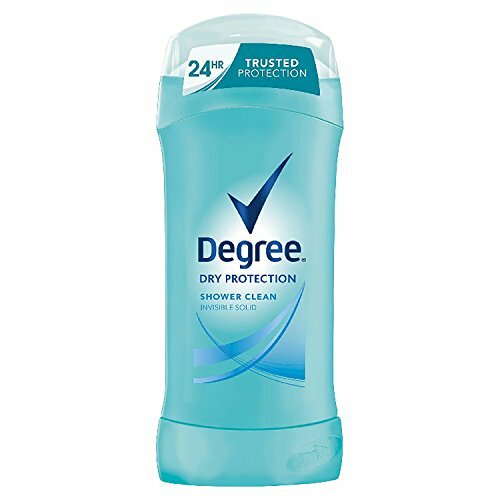 Degree's original deodorant & antiperspirant formula. Degree invisible solid antiperspirant deodorant stick is perfect for everyday use. Body-responsive formula you can count on for 24 hour underarm protection. For many people, deodorant or antiperspirant just not enough to keep you dry throughout all day. To avoid wearing or destroying beautiful clothes in public, you need to sweat down the sweat pad to absorb extra sweat. It sticks to the inside of your clothing instead of adhere directly to your skin,Thus your skin will not get redness or irritation. Strong adhesive will keep sweat pads stay in place and you won't be required embarrassing maintenance. 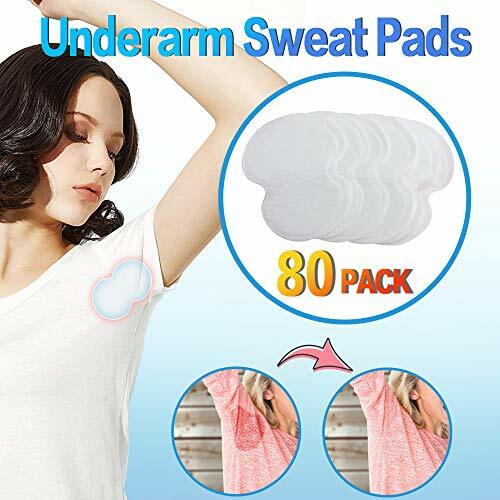 What's more, these sweat pads can effectively block the appearance of underarm sweat stains. - Remove the adhesive sheet from the pad. HIGHLY ABSORBENT - Stops Wet Thru. Effective Odor Stopper. Comfortable & Discreet, Easy Peel & Stick. CAN BE USED - Suitable for most skin types,hypoallergenic.Gender neutral design, non-scented materials provide an answer for both. COMFORTABLE & CONVENIENT - Super soft,ultrathin.Light weight and portable, nearly invisible.Disposable, no washing necessary.Perfect for outdoor and travel. PREMIUM QUALITY - With a mix of the highest quality microfiber fabrics,our sweat pads are efficient,breathable,extremely absorbent and sticky,but without residues. The SweatBlock wipe & lotion bundle is perfect for those with bothersome sweat. The antiperspirant wipes are perfect for underarm sweat, and the antiperspirant lotion is perfect for hand & foot sweat. Don't let sweat stop you from living your best life. Try SweatBlock risk-free today! STOP HAND SWEAT & SMELLY FEET: Shake and hold hands with confidence. Effective foot odor reduction. Hand antiperspirant perfect for hand hyperhidrosis and excessive hand sweating. SWEAT LESS, LIVE MORE: Foot and hand antiperspirant lotion for you, professionals, gamers, climbers & athletes. Will help with sweat prevention and foot odor reduction! 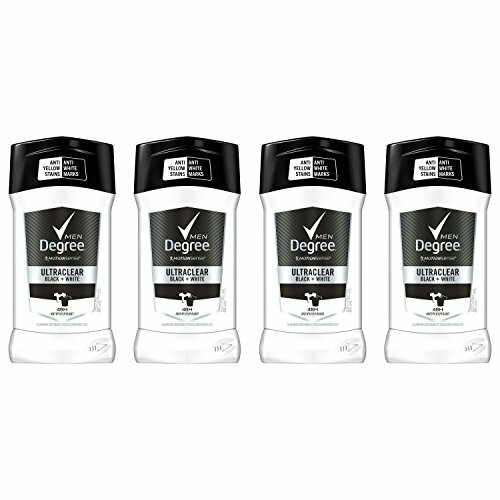 Dove Advanced Care Antiperspirant Deodorant, Go Fresh Cool Essentials 2.6 oz, 4 count Stay fresh no matter what the day throws at you with Dove go fresh Antiperspirant Deodorant Cool Essentials, 4 Pack. As part of the Dove go fresh range, Dove Cool Essentials comes in a refreshing cucumber and green tea scent to awaken your senses in the morning while caring for your underarms and protecting you against odor and wetness. Get a beautifully fresh feeling with Dove go fresh Cool Essentials Antiperspirant Deodorant. Nourishing your skin, this moisturizing deodorant leaves you with soft, smooth underarms that feel cared for and protected for up to 48 hours. 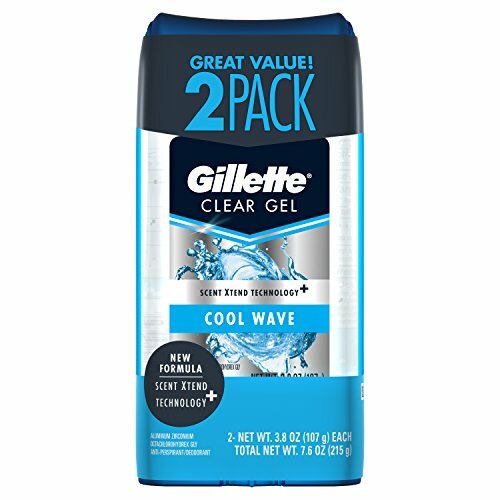 Combining Dove 1/4 moisturizers, a fresh scent, and effective ingredients, this antiperspirant deodorant protects against perspiration, and is gentle on underarm skin. Dove Cool Essentials even helps to relieve dry underarm skin from the irritation caused by shaving, resulting in softer smoother underarms. For best results, apply this cucumber and green tea scented antiperspirant after showering or bathing. Make sure your underarms are dry and then swipe the stick deodorant across each underarm two or three times until an even layer is applied. At Dove, our vision is of a world where beauty is a source of confidence, and not anxiety. So, we are on a mission to help the next generation of women develop a positive relationship with the way they look - helping them raise their self-esteem and realize their full potential. Protects against underarm wetness and odor. 0% alcohol (ethanol) formula helps with shaving irritation. 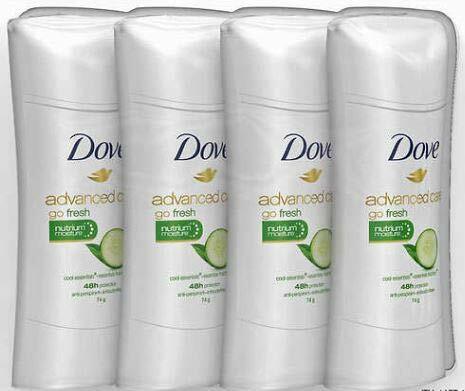 Contains Dove NutriumMoisture and moisturizers. Up to 48 hours of antiperspirant protection. PACKAGE-100 Pairs/200 PCS,every pair is individually packaged,Convenience and safe. CONFIDENCE BOOSTER-Keep you stay cool and dry all day,CONFIDENCE BOOSTER - Say goodby to those embarrassing sweat marks. No more yellow armpit stains. Suitable for both young and old,male and female. Strong self adhesive to the clothes. Maintain your favourite clothes underarm area stain-free. All natural absorbent, no ingredients. - Air circulate are very smooth and offer a very comfortable wearing. 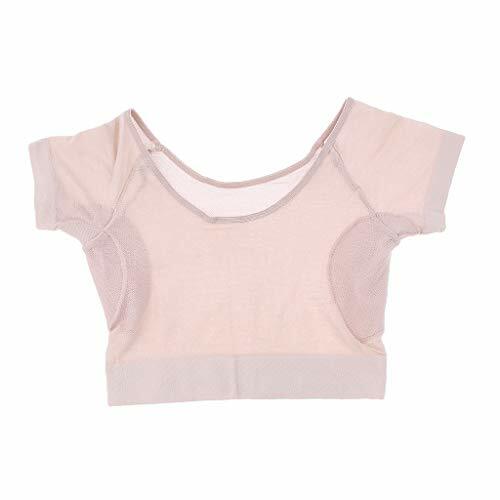 - Pads are designed to prevent unpleasant embarrassing perspiration spots on clothes and have the advantage to prevent odours for a longer period. 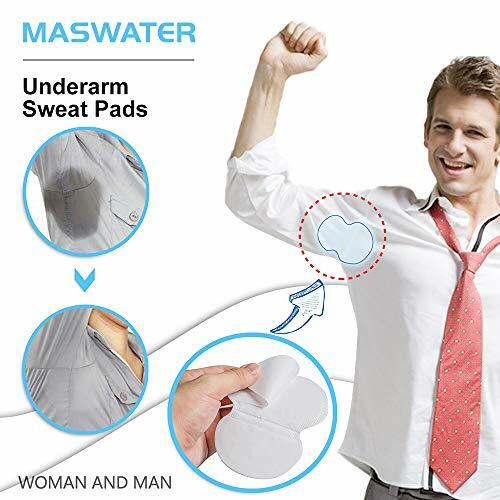 - Keep the underarms clean and dry, absorb bad odors all in a comfortable no-slip way of wearing. 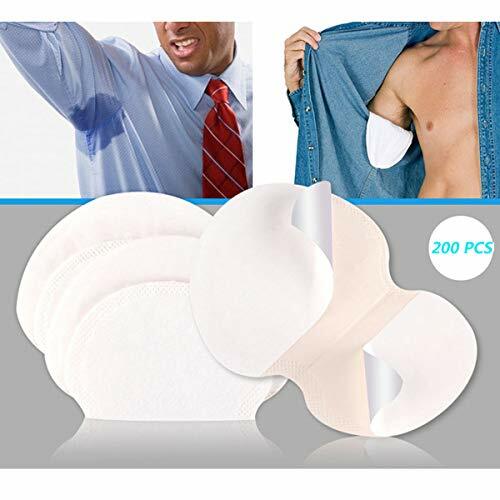 - Sweat pads are on under the shirt sleeve, you do not worry they how to fix it under your arm or drop out. - Universal size, suitable for the both man and women. Air circulate are very smooth and offer a very comfortable wearing. Pads are designed to prevent unpleasant embarrassing perspiration spots on clothes and have the advantage to prevent odours for a longer period. 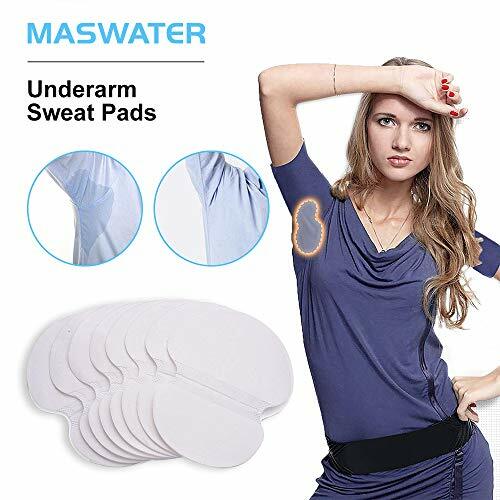 Keep the underarms clean and dry, absorb bad odors all in a comfortable no-slip way of wearing. Sweat pads are on under the shirt sleeve, you do not worry they how to fix it under your arm or drop out. Universal size, suitable for the both man and women.